Special Instructions: Cervical specimens should be avoided because of the effect of elevated sialidase activity. 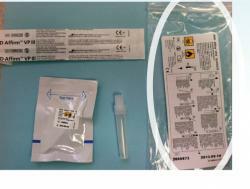 Specimens should not be collected from a patient who has used any vaginal product in the previous 72 hours, e.g., cream, gel, spermicide, or douching. Clinical Significance: G. vaginalis is associated (in concert with other organisms) with bacterial vaginosis. Trichomonas and candida species are known agents of vaginitis. Preferred Specimen(s): Vaginal swab from the posterior fornix and the vaginal wall. 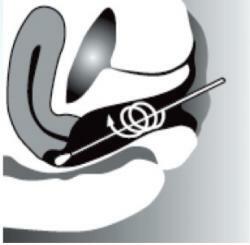 Place swab immediately in the AFFIRM™ VPIII Ambient temperature transport device. 1. Retrieve BD Affirm Kit for collection. Check expiration date before using. 2. Open Kit. Remove contents. Save bag to repackage specimen for transport. 3. 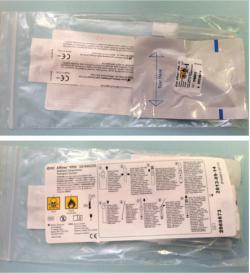 Label tube with the required patient information. Use tape to secure label. 5. 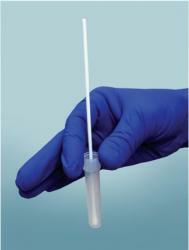 "Crack" inner ampule by squeezing dropper firmly, one time only. Caution: After the ampule is broken, do not repeatedly squeeze dropper. Doing so may cause injury. 6. Invert tube and dispense all liquid from dropper into tube. NOTE: Only a few drops of liquid present. 7. Open provided collection swab. 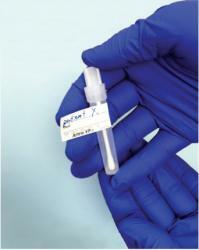 ONLY BD Affirm swab can be used. 8. 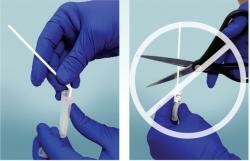 Collect patient sample using unlubricated speculum (NO JELLY or WATER) and provided. 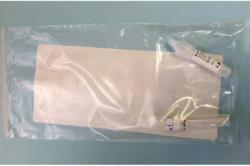 Affirm swab from posterior vaginal fornix. Swab lateral vaginal wall while removing swab. 9. 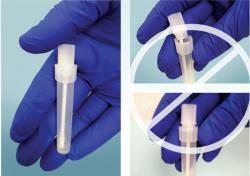 Drop swab immediately into tube until swab tip touches the bottom of the tube. 10. "Snap" off staff at score line. Do not cut. 11. Place cap securely so there is no gap. 12. 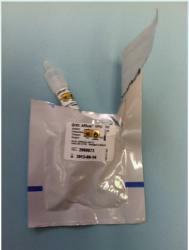 Place collected and labeled tub and reagent dropper into bag and return to DLO immediately for processing. Note: Only one patient tube & dropper per bag. 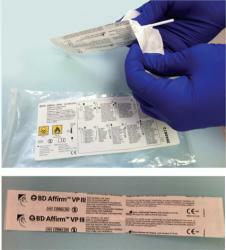 Minimum volume: One BD Affirm(tm) ATTS swab. Transport Container: BD Affirm(tm) VPII Ambient Temperature Transport System (Atts).